This is reprinted from an article that was published today from Tim’s daily blog, Useless Things Need Love, Too. There have been two high profile (at least to me) closings announced this week in my favorite part of Winston-Salem and on the same city block. This past Tuesday Augustine’s Bistro sent out a very short, but to the point, email to the restaurant’s closest supporters, friends and family announcing that they were closing as of that day. No head’s up, no closing ceremony, no time for goodbyes. About 45 minutes prior to that I received texts from both Aly Reich, the manager and Chris McDonough, the Mixologist (Intoxicologist?) Extraordinaire informing me that they were closing. They had just found out minutes before. According to an article by Michael Hastings of the Winston-Salem Journal, Eric Muck, the owner said that business just wasn’t there, as well as some preconceived notions of potential clients about the location. We’ll get to that in a bit. Today, in an article from Lynn Felder of Relish and WSJ, it was announced that The Community Arts Cafe is closing as of March 31. CAC was a performance center, cafe, wine & beer bar with a kitchen that was, for a time, a restaurant and catering area. I saw a performance by Spirit Gum Theater Company there as well as some of the SoundLizzard showcases there. The kitchen was the kitchen for La Rana Loca and Encore restaurants before that, complete with some beer taps. Fourth Street is the new main street in Downtown Winston-Salem. a/perture Cinema, Camino Bakery, Washington Perk, Mellow Mushroom, Jeffrey Adams on 4th, Hutch & Harris, Kings Crab Shack & Oyster Bar, Downtown Thai, The Honey Pot, Kabobs on 4th, Tropical Smoothie Cafe, Jimmy John’s, Foothills Brewing, Skippy’s Hot Dogs, Corks Caps & Taps, Quanto Basta, West End Coffee Shop, Mozelle’s, Olde Fourth Street Filling Station, Mooney’s, Downtown Deli, West End Cafe, Recreation Billiards, Bulls Tavern, The Stevens Center, The Winston-Salem Chamber of Commerce and The Less Desirables are just a FEW businesses on this street within a 9 block (or so) area. This is the street to be on. Now, both of these are on the 400 block of 4th Street. That’s two locations in one week announcing closings within 100 yards of each other. What in the world is going on!? I have some theories and I’m going to expound on them. These may be slightly off base or they may be close, but they’re mine. Let’s start with CAC. When it opened, it was an innovation to what was going on downtown. It was Fourth Street’s alternative to Trade Streets art galleries and had a performance center area that had a decent beer and wine selection. They eventually added catering and a restaurant. The space is huge and they’ve sublet some of it. But, really most people didn’t even know it was there. There was a sign, yes, but it wasn’t flashy and didn’t get in your face. Even when people did see it, it wasn’t really clear what it was. A chalk sandwich board outside becomes commonplace on the street and people tend to stop reading or looking. Posters in the windows weren’t really indicative, either. So, there was challenge number one. Then not too long ago, the WS Chamber took over the entire upper part, of the building. In doing so, they basically branded the whole building as WS Chamber. That’s the prominent signage and I’ll admit, that while I knew about CAC being in there, it was lost on the appearance that it was WS Chamber’s building and they did everything in there. If someone didn’t have business to do with the Chamber, then why go in, right? The Chamber are so dominant in that space that when they moved in they demanded (and got) all the parking behind the building and no one is allowed to park there without having credentials. The Chamber are brutal, at times. Yeah, I said it. Let’s talk Augustine’s. Augustine’s was at 401 W 4th. It was located in the UNCSA’s Stevens Center complex. Notice I said in the complex. Yes, it was in the same building but it wasn’t necessarily part of the Stevens Center. However, that is one of the major problems. People see the decorative awning of the Stevens Center that wraps all the way around the building and it full encompasses where Augustine’s was. 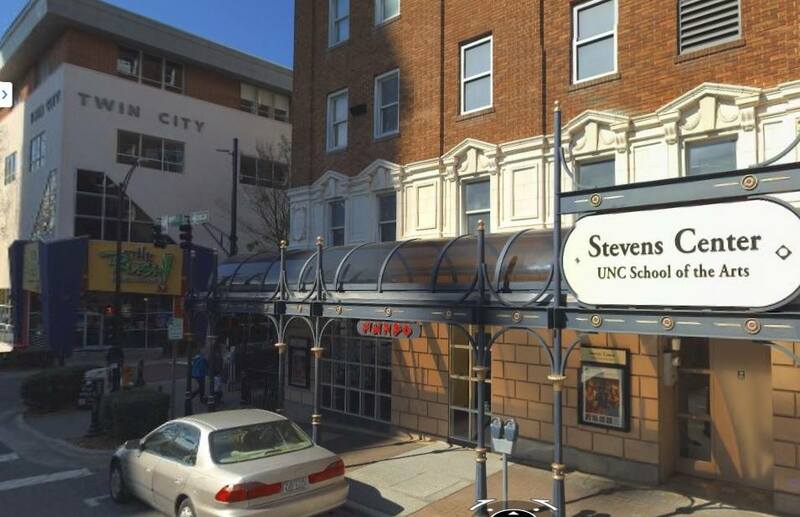 In fact, the Stevens Center’s branding was on the extreme edges of the awning, beyond any signage that any restaurant had out there. You can see from the picture here, what I mean. Thank you to Fam Brownlee for that picture. So, with the perception of Augustine’s being part of the UNCSA, there are a few stigmas. You get the low-brows who think the theatre is snooty and pompous and “I don’t want anything to do with those artsy-fartsy kind.” Or, because it’s in there, then it must be expensive. The fact is, I believe that Augustine’s prices could have actually been a little higher; the quality and portion size (no matter what some ridiculous Yelp! reviewers may have said) were very reasonably priced and I think Eric and Audrey shorted themselves slightly. I commend them for keeping the prices down as best as they can. I just think it was particular component of the problem. Another thing, being that no matter how much signage you put out, UNCSA isn’t going to let you outshine them so your signs will never be indicative of what is inside. That being said, they think the restaurant is just part of the Steven Center which gives the misconception that they’re only open when there are shows going on. They were open Tuesday through Saturday and even opening for lunches in the last month or so. Another thing about this location is no restauranteur is going to have money to spend on upfitting the kitchen and refrigeration of the place and they’re in dire need of it. UNCSA certainly isn’t going to pay to replace that, but they’ve had a problem with it for a while. Compound all these ingredients and they either all are the problem or they contribute to it. I’m not putting down either the Chamber nor UNCSA’s Stevens Center, but their being there is killing the potential for smaller businesses, namely restaurants in their presence. The 400 block of Fourth Street at least on the northern side is dominated by those two locations. The irony is that the Chamber is supposed to be there to help businesses not oppress them. Whilst they maintain such visible and occupied presence, nothing else can survive. Like grass when there are large trees around. The trees absorb all the nutrients and the surrounding area is barren. Both CAC and Augustine’s were reliant on word of mouth, however, if no one knows you’re there, they can’t tell anyone else. These locations have no money for marketing and without a marketing budget, there will be no traffic to your place. Places like I mentioned before on this street had prominent signage that represented their establishments. I’m challenging you all to become more aware of what is happening in this town that we love or if you’re from out of town, at least try to be more aware of what this town has to offer. I’m bracing for the next big closure. Which, sometimes when one thing goes another takes its place, but I’m afraid that the two spaces I’ve discussed are prompted to fail no matter what goes in there unless something changes on the marketing/signage front. According to Hastings’s article about UNCSA there’s talk that they’ll re-purpose Augustine’s for something that isn’t a restaurant. I’d be relieved if that happened because anything that goes in there, to would be doomed for failure. None of these factors are the lone factors, I believe. It’s a culmination of many things, these just being the prominent ones in my mind. These are great locations that happen to be horrible locales. Enough of my venting for the day. Don’t let our foodie town erode away. This entry was posted in Food News, Restaurant News and tagged a/perture Cinema, Augustine's Bistro, Bulls Tavern, Camino Bakery, Community Arts Cafe, Corks Caps & Taps, Downtown Deli, Downtown Thai, Downtown Winston-Salem, Foothills Brewing, Fourth Street, Hutch & Harris, Jeffrey Adams on 4th, Jimmy John's, Kabobs on 4th, King's Crab Shack & Oyster Bar, Mellow Mushroom, Mooney's, Mozelle's, Olde Fourth Street Filling Station, Quanto Basta, Recreation Billiards, Relish, Skippy's Hot Dogs, SoundLizzard, Spirit Gum Theatre Company, Stevens Center, The Honey Pot, The Less Desirables, Tropical Smoothie Cafe, UNCSA, Washington Perk & Provision Company, West End Cafe, West End Coffee Shop, Winston-Salem Chamber of Commerce, Winston-Salem Journal, WS Chamber. Bookmark the permalink. I really enjoyed your “vent.” I hadn’t even considered the Chamber’s part in the overall outward branding of that location. I’m sharing with my followers. Thanks!